Grants - CREATIVE ARTS FOUNDATION OF BREVARD, INC. Soprano, Eliana Berrean, 18, was awarded a generous grant from the Creative Arts Foundation of Brevard, to provide assistance toward her preliminary costs enrolling in a prestigious music school. Eliana auditioned for, and was accepted into the Mannes School of Music, in New York City, which specializes in operatic training and performance. Eliana has been performing in many programs for the Creative Arts Foundation, certainly a favorite among local audiences. 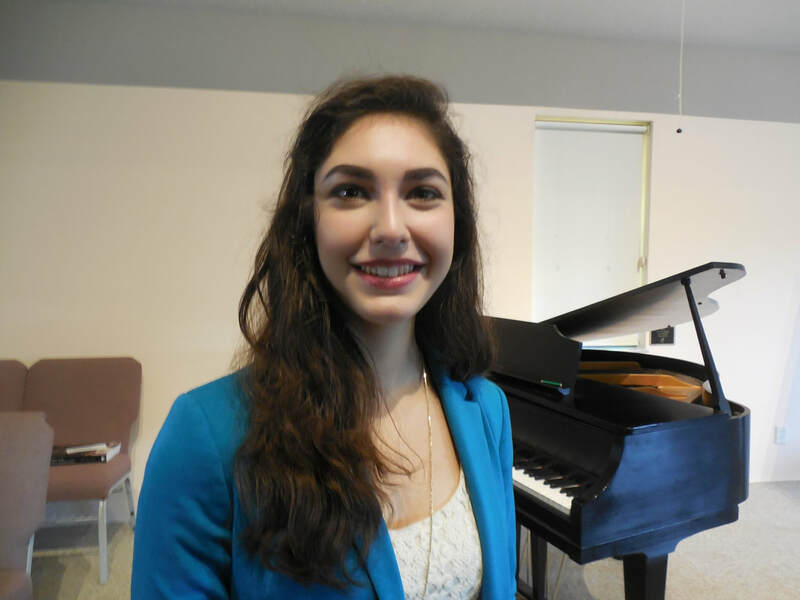 She is a highly talented music student, well-deserving of this award. Sebastian and Isaac Moorman, each received a cash grant to assist in their costs for attending summer music camp in Boston. Marea Pennell, Harpist, receives a grant to assist her with the purchase of a Harp. This young musician has not only shown the talents, but her willingness to study and work toward perfection. The Creative Arts Foundation thanks all the donors to the foundation in making these opportunities available to deserving students. Grant presented by Marshall Frank, President CAFOB and Suzanne Frank, Director CAFOB. Dana Alward, clarinetist, receives a grant to assist with the high cost of a summer music program. This young musician has not only shown the talents, but her willingness to study and work toward perfection. The Creative Arts Foundation thanks all the donors to the foundation in making these opportunities available to deserving students. Grant presented by Marshall Frank, President CAFOB. 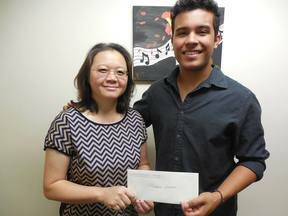 Jade Alvarez-Lauto, violinist, receives a grant to assist with the high cost of a summer music program. This young musician has not only shown the talents, but her willingness to study and work toward perfection. The Creative Arts Foundation thanks all the donors to the foundation in making these opportunities available to deserving students. Grant presented by Marshall Frank, President CAFOB. Concert Violinist, Tomas Lopez, 17, receives a cash grant from the Creative Arts Foundation of Brevard to help him attend a music program this summer in Europe. ​New CAFOB president, Jensee Lee makes the presentation. Wishing Tomas lots of luck. 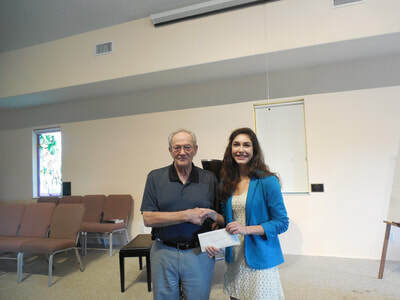 Pianist, Remington Howell, 19, receives cash grant from the Creative Arts Foundation to assist with costs associated with his travels to NYC where he will play solo at Carnegie Hall in October. This project was coordinated by piano instructor, Pervin Muradov, working on behalf of autism and Asbergers through a non-profit organization. 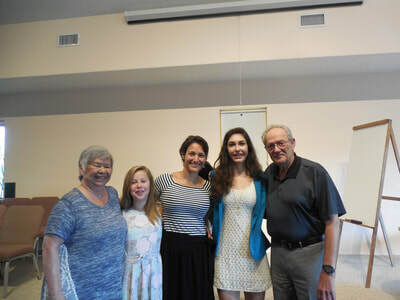 Alyssa Barry, age 16, advanced clarinetist and Brevard County talent, is the 13th music student since 2008 to have received a grant from the Creative Arts Foundation of Brevard. Miss Barry desires to attend a Summer music camp, only part of which her family could afford. After an interview and witnessing her fine talent, the Board of Directors voted to award her the requested funds. Miss Barry will be attending the music camp Summer 2015. She is a happy kid. The Creative Arts Foundation of Brevard Inc. (CAFOB) was established to encourage and support the creative and fine arts in Brevard County, Florida. The Foundation provides support to artistic individuals and individual artistic groups who have demonstrated exceptional ability and achievement in the field of creative arts, including but not limited to: music, painting, sculpture, dance, acting, literature and photography. BE citizens of the United States or documented resident aliens. The Foundation provides assistance in the form of monetary grants to approved applicants in order to advance the development of their skills, such as lessons, attending competitions, specialized or advanced training, schooling and related expenses. Grant funds will be made available by the Board of Directors 30 days after approval. The CAFOB Board of Directors is composed of residents of Brevard County who are committed to supporting the highest levels of achievement and performance in the creative and fine arts. All applicants who meet the initial criteria will be given due consideration for an award regardless of gender, race, age, ethnic background, country of origin or religious beliefs. Considering the limitation of Foundation funds and the volume of applications, not all of those who apply will receive an award. Applicants must be prepared to submit written, electronic or video samplings of their artistic endeavors for initial review by the Board. individuals who are reputable persons and who have significant authority, of note, knowledge or expertise in the applicant’s specific field of arts. Such letters must accompany the original application. Applicants must also demonstrate financial need. Submit up to 15 photographs, 5" X 7" or larger, of the art type you plan to produce. Identify each photo sheet with artist’s name and title of the particular photograph at the top margin, or by attaching a tab. Please identify the setting of the photo, type of camera and date taken. Submit at least five photographs, 5" x 7" or larger depicting your work, with title/name of the piece clearly visible at the top right-hand margin. Artist(s) name should appear on the back of each photo and should indicate the medium, e.g. oil, water colors, clay, metals, etc. Submit a CD or DVD which includes at least two pieces, songs, etc., that clearly demonstrates the artist’s outstanding musical talent. Clearly label the CD/DVD with the name of song, or musical piece, the composer, and date that the CD/DVD was made. The piece(s) played/or sung, should be no less than two minutes and no more than ten minutes. CD/DVD’s should also be accompanied by a recent photo of the applicant(s). Submit a DVD depicting between ten and twenty minutes of a performance or a production by the applicant. Clearly label the DVD with the name of the performer(s), creator of the work, original date of the DVD and the applicant’s artistic role, e.g. director, actor, etc. Collate and copy the complete packet by page number. Make and submit two (2) individual sets of the packet and staple separately, being sure the applicant(s) name appears at the upper left corner of each page, and your name at the upper right corner of each page. Keep a complete copy for your records. The Creative Arts Foundation of Brevard, Inc.